Overall Condition Excellent to very good. Bead Size 11-12 mm in diameter. 5-6 mm hole size(measurement is approximate). See picture with penny for size comparison. U.S. penny is 19mm in diameter. Strand Length 36 inches (includes string/raffia). Picture is an example, yours will be similar. 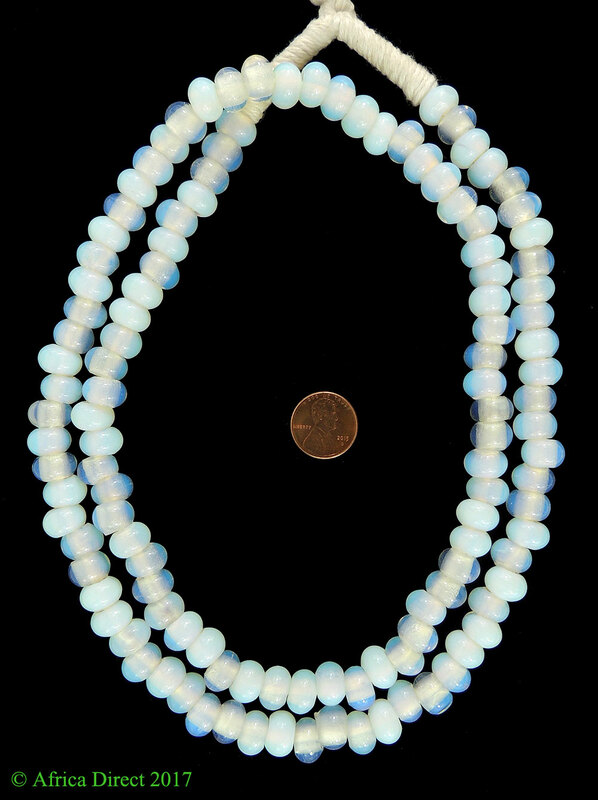 Additional information: The origin and period of these rare opalescent beads are uncertain. They have been attributed to Venice, Bohemia, Germany and the Netherlands, where they are called “18th century Amsterdams.” The beads can be found on the sample cards of a prominent London merchant named Moses Lewin Levin that are dated 1851-1869. 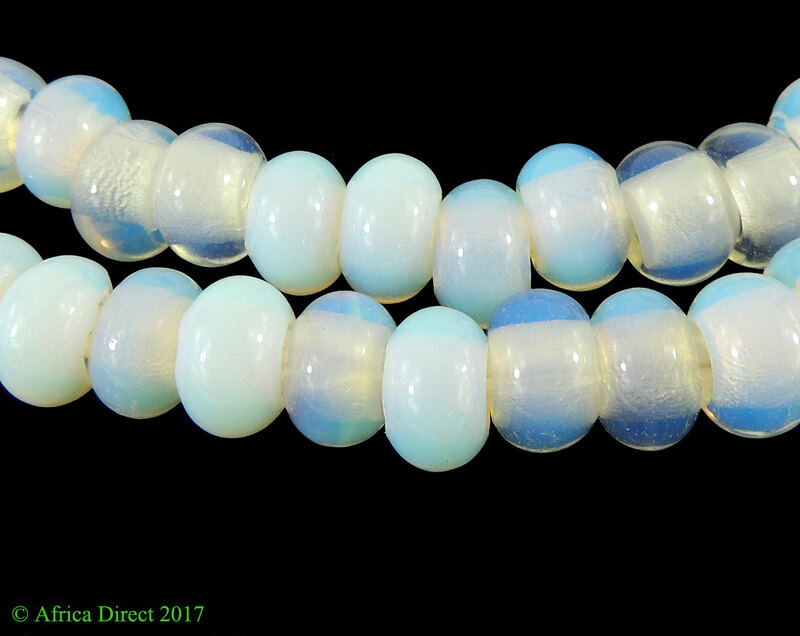 What is not in question is the ethereal beauty of the moon bead, which appears to be holding a beam of moonlight within it. Traders to West Africa in the 1800s and 1900s used these beads to acquire palm oil and other types of African produce. The beads were favored by the natives of Nigeria where they were used by Yoruban priests to decorate shrine sculptures such as the staff of orisa Oko. It was believed by Yoruban chiefs that moon beads represented wealth and status and that they possessed magical and therapeutic powers. This strand is a newer version made in the Second half of the 20th century, in the Czech Republic. The term "Trade Beads" typically applies to beads made predominately in Venice and Bohemia and other European countries from the late 1400s through to the early 1900s and traded in Africa and the Americas. Many of these beads have been attributed to being made in Germany, France and the Netherlands as well.